It’s shark week. Oh yeah… we all like apex predators. They sit there, calm and powerful. No need to thump their chest or make a ruckus. People just know. 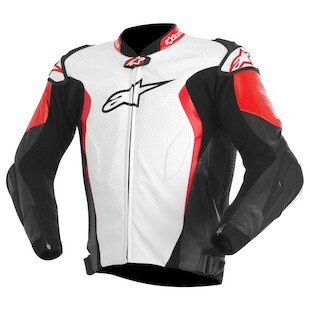 That is how it is with the new Alpinestars GP Tech Leather Jacket. It is kind of a rockstar. As the top half of the full on Alpinestars GP Tech Race Suit, the GP Tech Leather Jacket has all of the features built for a track… just without the pants. As an upgraded replacement to the current GP Tech jacket, the newest iteration will make use of localized perf throughout the arms and stretch accordion panels while also incorporating an attachment for a full race back protector (it can also take a street sized insert). Additionally, increased stretch throughout the elbows and a removable inner liner have been included to up the comfort and convenience factors. All of this is encased in a full cowhide outer shell of 1.2/1.4mm leather that comes with CE certified protectors at the shoulders and elbows… as well as external PU slider protectors that have been proven throughout the MotoGP and WSBK levels of racing. In the end there are rabbits and deer on one side of the coin, and there are tigers, timberwolves, pterodactylus, and tyrannosaurus on the other. The latter side of the coin would be wearing the GP Tech Leather jacket.